Glucophage Common Uses: Glucophage is a biguanide-type medication that is used along with a diet and exercise program to control high blood sugar in diabetic patients. Glucophage works by helping restore your body's proper response to the insulin you naturally produce, and by decreasing the amount of sugar that your liver makes and that your stomach/intestines absorb. Controlling high blood sugar helps prevent heart disease, strokes, kidney disease, blindness, and circulation problems, as well as sexual function problems (impotence). How to use Glucophage: Follow the directions for using Glucophage provided by your doctor. TAKE Glucophage with food. DRINK PLENTY OF FLUIDS while taking this medicine. CONTINUE TO TAKE Glucophage even if you feel well. Do not miss any doses. Use Glucophage regularly in order to get the most benefit from it. To help you remember, use it at the same time(s) each day. Glucophage may come with a patient information leaflet. Read it carefully. Ask your doctor, nurse, or pharmacist any questions that you may have about this medicine. STORE THE U.S. PRODUCT at room temperature between 68 and 77 degrees F (20 and 25 degrees C), away from light and moisture. Brief storage from 59 and 86 degrees F (15 and 30 degrees C) is permitted. Do not store Glucophage in the bathroom. STORE THE CANADIAN PRODUCT between 59 and 86 degrees F (15 and 30 degrees C). Keep all medicines away from children and pets. IF YOU MISS A DOSE OF Glucophage, take it as soon as possible. If it is almost time for your next dose, skip the missed dose and go back to your regular dosing schedule. DO NOT take 2 doses at once. Glucophage Cautions: FOLLOW THE DIETARY PLAN provided by your doctor. KEEP ALL DOCTOR AND LABORATORY APPOINTMENTS (e.g., liver and kidney function tests, fasting blood glucose, glycosylated hemoglobin, complete blood counts) while you are using this medicine. Regularly check your blood or urine sugar as directed by your doctor. BEFORE YOU HAVE ANY MEDICAL OR DENTAL TREATMENTS, EMERGENCY CARE, LABORATORY TESTS, OR SURGERY, tell the doctor or dentist that you are using this medicine. During times of stress such as fever, infection, injury or surgery it may be more difficult to control your blood sugar. Consult your doctor, as a change in your medication may be required. LIMIT ALCOHOL INTAKE while using this medicine. BEFORE YOU BEGIN TAKING ANY NEW MEDICINE, either prescription or over-the-counter, check with your doctor or pharmacist. 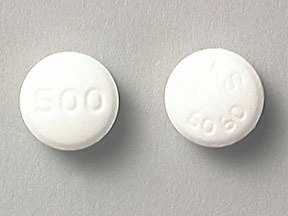 Caution should be used in the elderly since they may be more sensitive to the effects of this drug. FOR WOMEN: This medicine can cause changes in the menstrual cycle (promote ovulation) in women with certain fertility problems, therefore increasing the risk of becoming pregnant. Consult your doctor or pharmacist about the use of reliable birth control while using this medicine. IF YOU PLAN ON BECOMING PREGNANT, discuss with your doctor the benefits and risks of using this medicine during pregnancy. IT IS UNKNOWN IF THIS MEDICINE IS EXCRETED in breast milk. DO NOT BREAST-FEED while taking this medicine. Possible Glucophage Side Effects: Also see WARNING. SIDE EFFECTS, that may go away during treatment, include metallic taste in mouth, nausea, stomach upset, and diarrhea. If they continue or are bothersome, check with your doctor. If stomach symptoms recur later (after you are on the same dose for several days or weeks), tell your doctor immediately. A late recurrence of stomach symptoms may be due to a serious medical condition (lactic acidosis). This medicine usually does not cause low blood sugar (hypoglycemia), but this effect may occur if you do not consume enough calories (from food, juices, fruit, etc.). The symptoms include chills, cold sweat, dizziness, drowsiness, shaking, rapid heartbeat, weakness, headache, fainting, tingling of the hands or feet, or hunger. It is a good habit to carry glucose tablets or gel to treat low blood sugar. If you are in a situation where you don't have these reliable forms of glucose, eat a quick source of sugar such as table sugar, honey, or candy, or drink a glass of orange juice or non-diet soda to quickly raise your blood sugar level. Tell your doctor immediately about the reaction. To help prevent hypoglycemia, eat meals on a regular schedule and do not skip meals. Symptoms of high blood sugar (hyperglycemia) include thirst, increased urination, confusion, drowsiness, flushing, rapid breathing, or fruity breath odor. If these symptoms occur, tell your doctor immediately. Your medication dosage may need to be increased. IF YOU EXPERIENCE difficulty breathing; tightness of chest; swelling of eyelids, face or lips; or if you develop a rash or hives, tell your doctor immediately. Do not take any more doses of Glucophage unless your doctor tells you to do so. If you notice other effects not listed above, contact your doctor, nurse, or pharmacist.